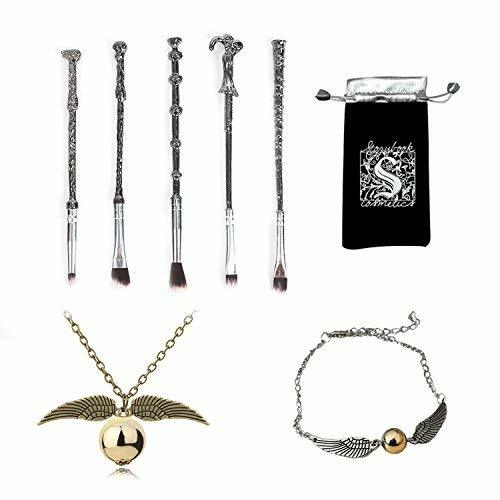 potter makeup brush with it\'s own special wand, Cool set for makeup ladies who also a big fans of harry wizard. Each set is easy to carry and maintain, can keep in clean and won\'t hurt your skin, Great makeup set for everyone. Beauty makeup brushes kit used for basic makeup, Blending, Blush, Eyeliner, Face Powder and so on. daily makeup, High density soft bristles,have silky touch feeling and easy to stick powder,non- shedding and easy to stick. Best Gift - Unique design of the handle brings with the glittering appearance, Suitable for individual use or as a gift to your families or friends. My 17 year old daughter just loves this!